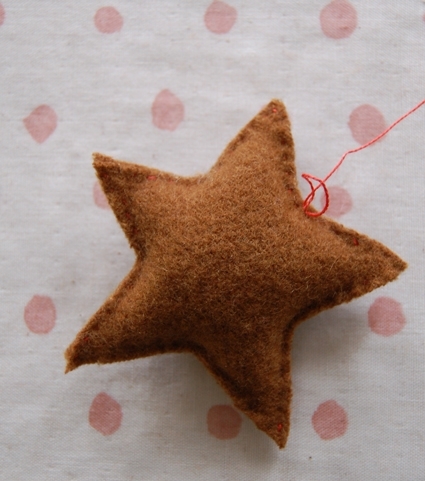 On a piece of paper draw a star about 3½ inches across. You should like the way it looks but it does not have to be perfect. 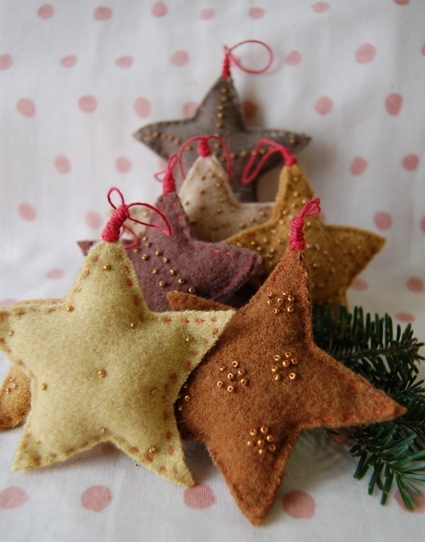 The charm of this ornament comes from its’ hand made imperfection. 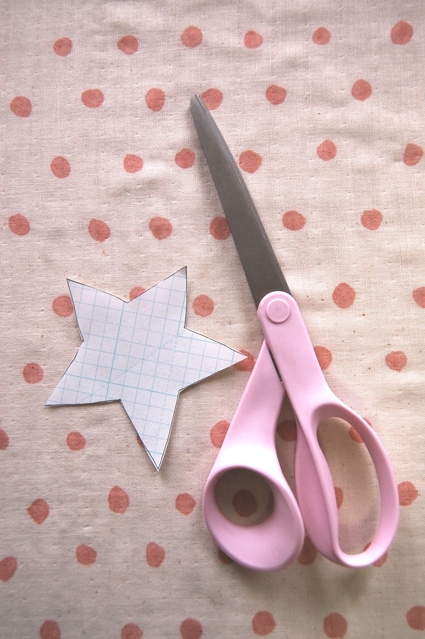 This paper star will be your template. Cut it out carefully. 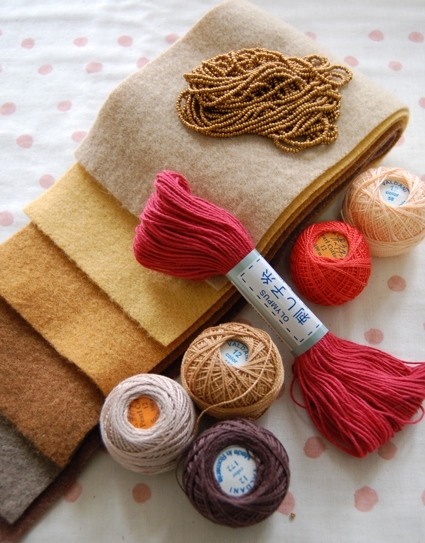 Lay your template on your wool and trace around it with tailor’s chalk. 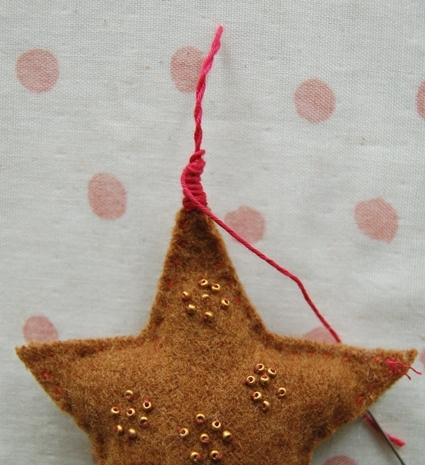 To get the maximum amount of ornaments out of the precious felted wool, trace the stars very close to one another. With my template I was able to draw five star shapes per piece. Carefully cut out your shapes. 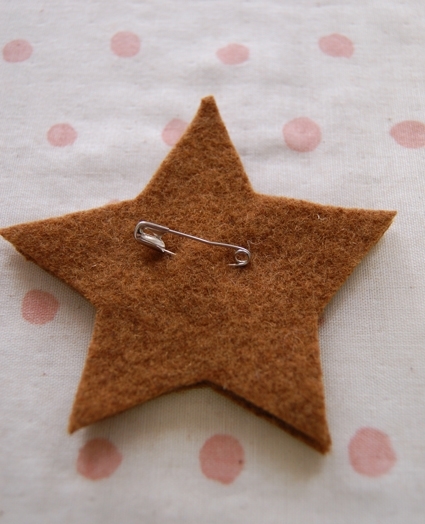 Line up two felt star shapes on top of each other so they match exactly and secure with a safety pin. 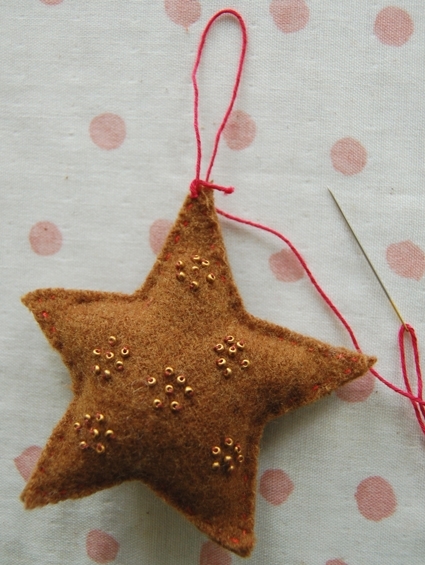 Using a small running stitch and your Salmon or Peach colored thread sew closely around edges of the star. 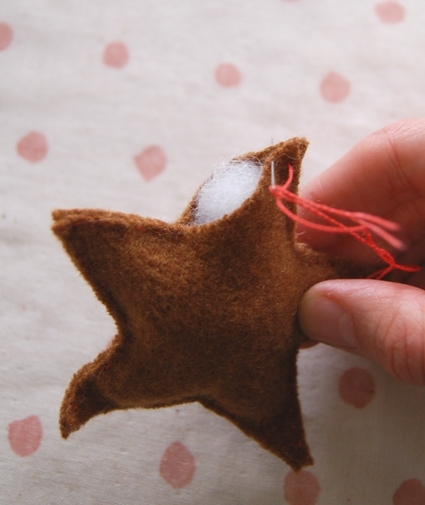 Make sure to hide your starting knot inside the ornament by starting in between the two layers. 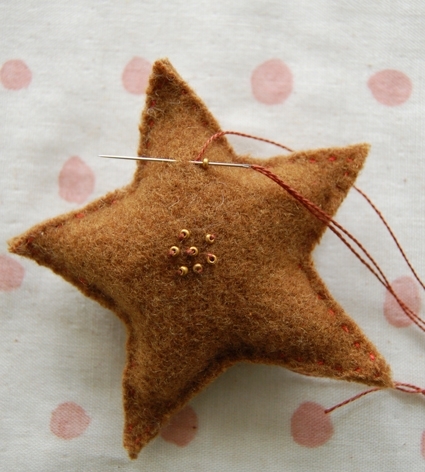 Leave the last point of the star unsewn to stuff it. Stuff the star one pinch of stuffing at a time making sure to get into the points. 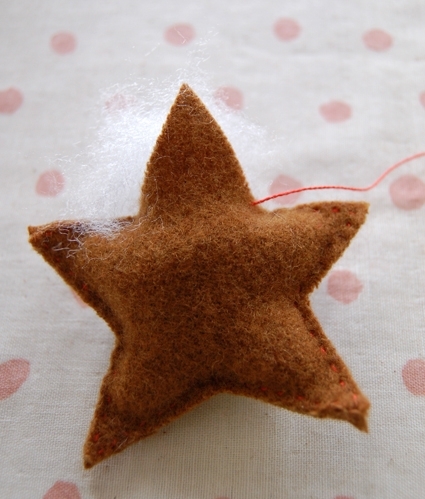 When it’s stuffed to your liking continue to sew the star closed, stuffing the last point as you go. 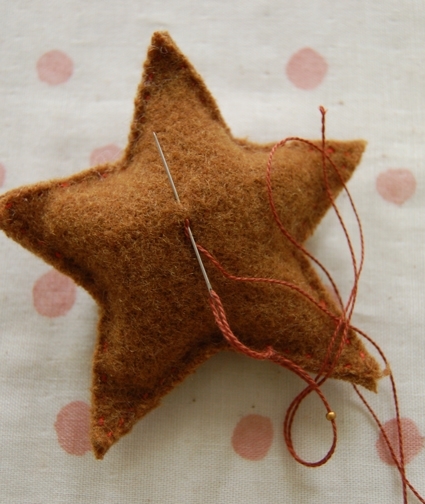 Tie a securing knot and hide the thread end inside of the star’s stuffing, trim thread. The beading is the most creative part of this pattern. 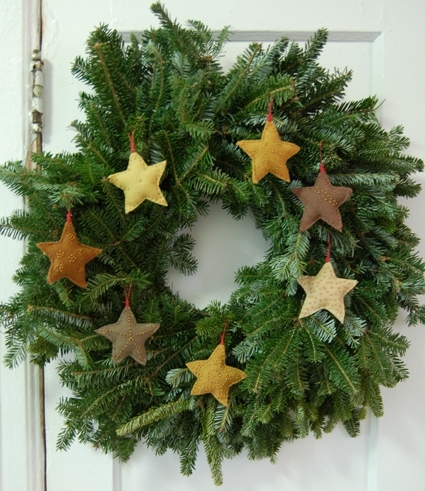 I beaded all my ornaments differently, making up the patterns as I went along. The process described below can be used to create any design you desire. Thread your beading needle (I used a size 10 sharp needle) with a brown embroidery thread to match your wool and tie a small knot at the end. A Note: Valdani embroidery thread barely fits into a size 10 sharp, so you might need a needle threader for this. You could also use a beading needle and beading thread but I liked how well the Valdani thread matched my base colors. 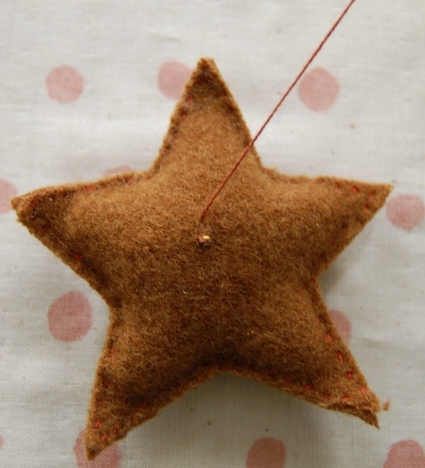 Pull the needle through one side of the star to the other. Let the knotted end of the thread pop through the first layer of wool but not come out the other side, thus hiding your knot. Thread one bead onto your needle and then stick your needle right next to where it came out. 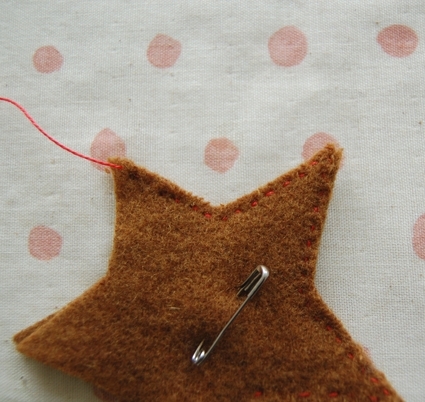 Pull your needle through the stuffing (but not through to the other side) to the next spot where you’d like to place a bead and pull your thread. The bead should pop into place. Repeat in whatever pattern you like. 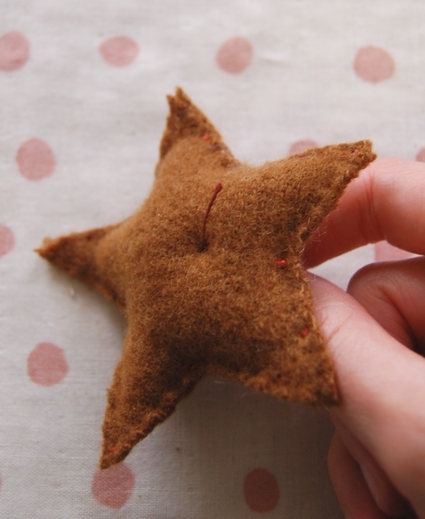 Now that you have a beautiful stuffed star you have to hang it somewhere. 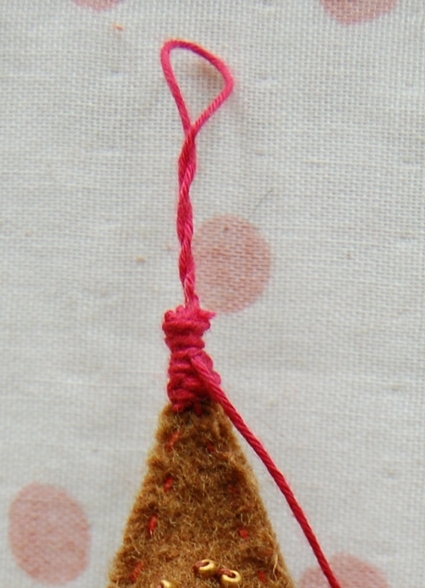 Thread an embroidery needle with an 18” length of the red Sashiko thread and tie a small knot in the end. 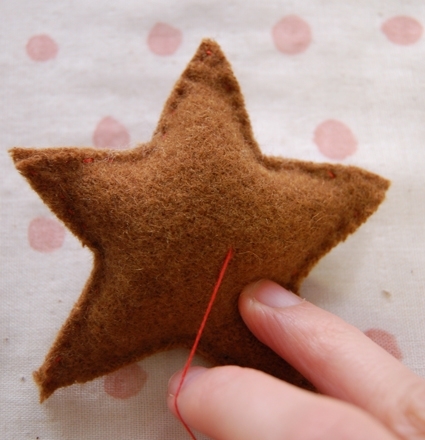 Pull your thread through the very top of the star’s top point and create a 1½ inch loop, putting your needle back into the top of the point. 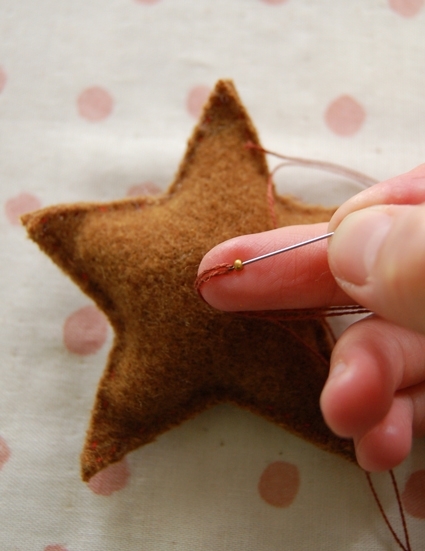 Wrap your thread tightly around the tip of the point many times. 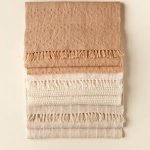 Tie a small knot and pull your thread through the wrap, then trim the thread end close to the wrap. Love ’em, Molly! So sweet! me encantaron tus estrellas son realmente hermosas!! lov your stars they are really beautifull!! 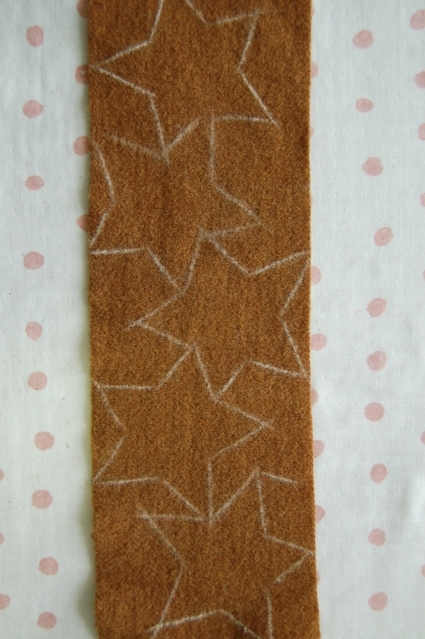 You might find it easier to do the beading on the star BEFORE you stitch and stuff it. Just a suggestion to consider. 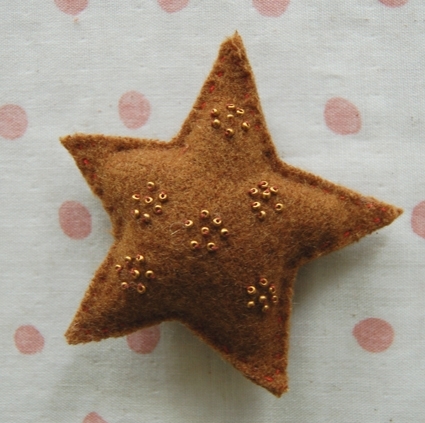 I love the idea of these simple stars and will probably do some with some wool felt I've got on hand. 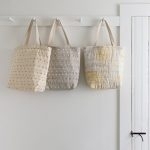 I've made these in some varying ways–use the darker, woodsy colors, and use 3-4 strands of metallic embroidery thread. 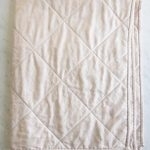 In some, I used paler colors and darker beading and darker threading. I also made some with the nice felt and beading on one side, and a complementary fabric on the other side. 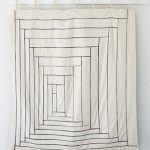 To make a beautiful mobile for a baby's room, the lighter colors and fabric are really beautiful! THEY ARE SO OLD FASHIONED LOOKING. LOVELY. REALLY CUTE.